Trials in Australia and the UK involving Ericsson and Vodafone indicate the NB-IoT is starting to become a reality. Meanwhile Vodafone has started trialling NB-IoT in the UK, as reported by Light Reading. Energy company Scottish Power is Vodafone’s first UK NB-IoT customer and is using IoT temperature sensors to detect when some of its remote kit might be overheating. They’re apparently powered by standard AA batteries and each one costs a couple of quid. 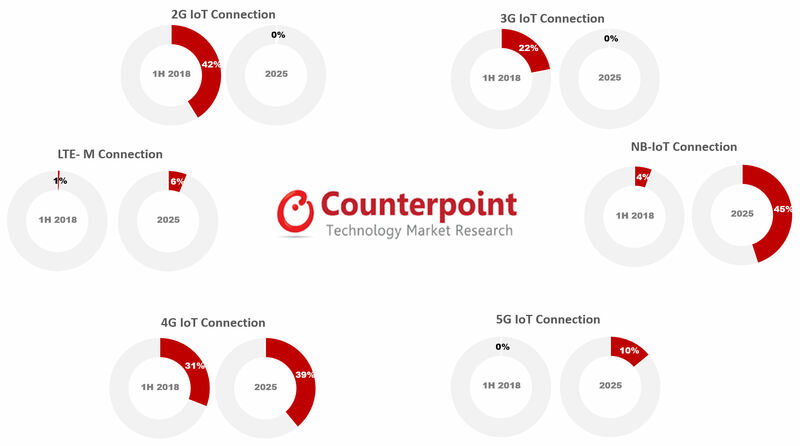 Lastly Counterpoint Research has found that global cellular IoT connections grew by 72% in the first half of this year and forecasted NB-IoT will account for around half of all IoT connections in the long term. As you can see from the charts below most of the action seems to be happening in China, but Vodafone is leading the international effort. “Revenue generation from the IoT ecosystem is not siloed to any one specific segment of the value chain, rather it is distributed among all segments,” said Neil Shah of Counterpoint. “On an average for a cellular IoT solution deployment, connectivity represents around 12%, whereas hardware components, modules and devices represent 22%. The big variable with IoT, of course, is revenue. It doesn’t look too tough to scatter billions of sensors all over the place and connect them to the cloud via NB-IoT or whatever, but getting companies to pay for services on the back of them is another matter. It looks like a lot of the commercial precedent will be set in China, so the rest of the world might wait to see how that plays out before committing. Chinese internet giant Tencent is the latest company to join the LoRa Alliance, adding credibility to the technology which has perhaps been viewed as substandard to NB-IoT. Tencent said in a statement it has been investing in LoRaWAN, most notably in building a LoRaWAN network in Shenzhen with local partners, but also in providing device-edge-cloud LoRaWAN solutions on its network for a wide variety of IoT application and end users, such as government public services. personal IoT devices, etc,” said Hongtao Bie, Vice President of Tencent Technologies. The pros and cons of LoRa in comparison to Sigfox and NB-IoT have been much debated over the last few years, though it does seem NB-IoT is winning out. With the majority of telcos throwing weight behind NB-IoT, the influence of non-cellular technologies is starting to be diluted. There will of course be benefits with technologies such as LoRa, campus connectivity for unlicensed spectrum is one, but as data usage ramps up you can see why the telcos are nervous. The danger lies with mission critical. LoRa might have a cost advantage, but without the licensed spectrum option, the telcos are justifiably tentative considering the potential damage to already battered spreadsheets. There are of course examples of telcos marrying the two technologies, Orange is producing some interesting initiatives in this area, though LoRa is not necessarily making the impact it had in mind. Maybe it is because it is a proprietary technology? There will of course be use cases for the technology, and being able to throw around the Tencent logo as a supporter will also help. Low power IoT network technology isn’t much good if it can’t easily cross national borders, so DT and Vodafone have been looking into that with the help of the GSMA. In fact the GSMA was the one to make the announcement, claiming the two operator groups “…have successfully completed the first international roaming trial in Europe using licensed NB-IoT technology.” NB-IoT is generally accepted to be the default LPWAN technology, for which Vodafone has been one of the most active cheerleader, so it’s no surprise to see it involved in this. “This development shows the successful evolution of the technology and I am confident that it will lead to a raft of new applications for NB-IoT, such as the cold chain monitoring of goods across borders,” said Vodafone director of IoT Stefano Gestaut. The trial used global SIMs from DT on Vodafone Spain’s network and global Vodafone SIMs on T-Mobile Austria’s network and commercial NB-IoT modules. The announcement somewhat redundantly stresses that NB-IoT roaming is especially important for anyone deploying LPWAN devices on a global basis. The GSMA is claiming some credit for creating a mobile IoT initiative that may or may not have played a significant role in this happening. Ericsson looked to capture the headlines over MWC with a big focus on IoT, and the trends have continued with two new announcements in Saudi Arabia and Greece. Starting in the Middle East, Ericsson has bagged a new customer in STC as part of a nationwide expansion of its 4G network in Saudi Arabia, including the deployment of LTE Advanced and Narrow Band-Internet of Things (NB-IoT) in Radio Access Network. On the LTE-A side of things, the pair will deploy new 5G-ready hardware into the network to make use of STC’s newly acquired spectrum in the 700 MHz band. The claim here is that the project will increase STC network throughput in 4G by up to 50% for smartphones, though that crafty ‘up to’ metric is still there. Seems like advertisers aren’t the only one making use of the grey areas. Over for IoT, STC will be deploying NB-IoT tech in RAN across its expanded network to support smart city ambitions. NB-IoT is also the focus of the announcement with Greek telco Cosmote. Here the pair have completed the deployment of the first cellular NB-IoT clusters in Cosmote’s network across eleven cities in Greece. The aim here is to support and develop massive Machine Type Communications (mMTC) usecases. The IoT stance does seem to be working for Ericsson, so why change it. We noticed that the Ericsson stand was certainly very busy, perhaps even busier than its main competitors, across MWC perhaps owing to this IoT messaging. That said, it might be down to stringent access to the Huawei Village and the free lunch the Swedes were offering. Anything to avoid the dreaded and dreary beigeness of the MWC cafes. With MWC just around the corner we shouldn’t be surprised at a bit of chest beating from operators. Deutsche Telekom has stepped up to the plate saying everyone else is comparatively useless at NB-IoT. The claim is based on DT’s current NB-IoT, which now extends to eight European countries as well as the US. While this does sound very impressive, it should be worth noting the rollout is not complete in all of these countries, but nationwide coverage should come before too long. According to DT, its European rollout in on schedule. “Deutsche Telekom’s aim is to deliver this exciting technology across Europe and the US as quickly as possible, both by making the NB-IoT sensor network available everywhere as well as actively driving the development of innovative NB-IoT solutions,” said DT’s Ingo Hofacker. Just like 4G coverage is a thing to shout about now, NB-IoT coverage will soon become one. For multinational companies who have an interest in IoT, working with a telco which can offer coverage in multiple markets will be a more attractive proposition. It cuts down on paperwork and the benefits of scale will be there. DT seems to be a typically German job on running a highly efficient rollout. In terms of the actual progress, the nationwide rollout is complete in the Netherlands, while DT has promised nationwide coverage in other markets at some point in the opaque future. The telco does have an NB-IoT presence in an additional five European nations, as well as Germany, though details on when this would actually be a nationwide presence are unsurprisingly thin. So DT is the best at NB-IoT because it says so, and your correspondent is going to be the tallest man in London. Italian operator TIM says it’s the first in Italy to make its network ready for NB-IoT services, which will be offered at the end of this month. 75% of the TIM network is apparently up and running with NB-IoT technology, which is one of the more advanced flavours of narrowband wireless available. This means 5,000 municipalities will be able to live the internet of things dream in a couple of weeks. Smart metering seems to be quite a popular early use-case for IoT, but the business case remains unproven and for consumers they seem to solve problems most of us didn’t realise we had. But having said that we have to start somewhere and TIM seems to be doing a good job of leading the way, in Europe at least. T-Mobile US has begun the venture into new grounds, with bold plans to light up the first nationwide Narrowband-IoT (NB-IoT) network in 2018. Seemingly not happy with the nationwide headache it as given operators in the consumer market, the magenta army has begun marching towards the promised riches of IoT. 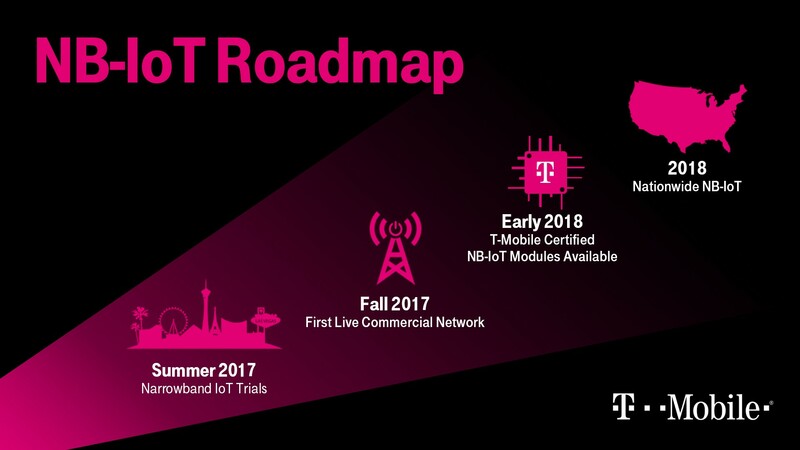 Next month, T-Mobile plans to launch (what it claims is) the first commercial NB-IoT network in Las Vegas, before rolling out across the US by mid-2018. While causing chaos in the world of unlimited data tariffs and zero rating offers might have been grabbing the attention in recent months, it’s not the only area T-Mobile has been playing around in. In July, the operator teamed up with Qualcomm and Ericsson to complete Narrowband IoT field tests on a live commercial network, using 200 KHz of T-Mobile’s AWS spectrum. The initiative itself looks to be quite a useful one, and got the full involvement of City of Las Vegas’ innovation team as well. Use cases tested included flood and storm drainage sensors, smart city lighting solutions, and environmental monitoring, to keep a handle on temperature, humidity and environmental gases. Back on the nationwide NB-IoT network, the first product offering from T-Mobile will be known as SyncUP Fleet, a fleet management and monitoring service to help reduce fuel consumption, maintenance issues and other costs for enterprise organizations and governments. And in all fairness, it does look pretty simple to use. Customers plug the SyncUP Fleet device into each vehicle’s standard on-board diagnostics (OBDII) port and create their online account to get started. Through a cloud-based platform, which can be accessed through either laptop or smartphone (neat), the fleet manager gets a more birds eye view of all the assets. IoT in action. Though the claims of a nationwide NB-IoT network are bold, it does appear the T-Mobile team believes it is a bit more suited to cover more area geographically. Executives have argued competitors such as Verizon and AT&T are too focused on the millimetre wave spectrum which isn’t as suitable for IoT, but the significant wedge of 600 MHz spectrum offers much more flexibility and breadth. It is always sensible to take T-Mobile claims with a pinch of salt, but you can’t argue with the evidence. The last few quarters have seen T-Mobile live up to its chest-beating of bigger, better and faster, so it might be a smart bet to back the magenta army in the IoT race.